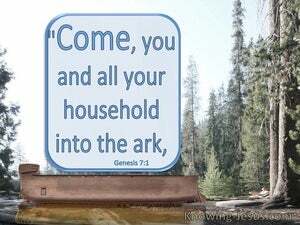 ﻿ Genesis 7:1 Then the LORD said to Noah, "Enter the ark, you and all your household, for you alone I have seen to be righteous before Me in this time. Then the Lord said to Noah, "Enter the ark, you and all your household, for I have seen that you [alone] are righteous before Me in this generation. Then the LORD told Noah, "Come you and all your household into the ark, because I've seen that you alone are righteous in this generation. And LORD said to Noah, Come, thou and all thy house into the ark, for I have seen thee righteous before me in this generation. 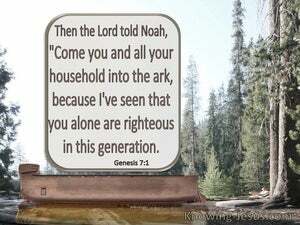 And the Lord said to Noah, Come with all your household into the ark, for I have seen you to be righteous (upright and in right standing) before Me in this generation. And the Lord said to Noah, Take all your family and go into the ark, for you only in this generation have I seen to be upright. And the LORD said unto Noah, Enter thou and all thy house into the ark; for thee have I seen righteous before me in this generation. And Jehovah will say to Noah, Come thou, and all thy house into the ark, for thee I saw just to my face in this generation. Then Yahweh said to Noah, "Go--you and all your household--into the ark, for I have seen you [are] righteous before me in this generation. And Jehovah said to Noah, You and all your house come into the ark, for I have seen you righteous before Me in this generation. The Lord said to Noah, "Come into the ark, you and all your household, for I consider you godly among this generation. The LORD said to Noah, "Come with all of your household into the ship, for I have seen your righteousness before me in this generation. And Yahweh said to Noah, Enter thou and all thy house, into the ark, - for, thee, have I seen righteous before me, in this generation. And the LORD said to Noah, Come thou and all thy house into the ark: for thee have I seen righteous before me in this generation. Yahweh said to Noah, "Come with all of your household into the ship, for I have seen your righteousness before me in this generation.